Mars Needs Moms might go down in history as the biggest bomb of 2011. With a budget of $150 million and a box-office gross of $21 million, it’s definitely one of Disney’s worst investments in recent years. So, the studio has to have very high hopes for the animated movie’s DVD and Blu-ray release. 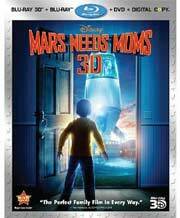 Mars Needs Moms was released on DVD , Blu-ray and Blu-ray 3D on Aug. 9, 2011. Walt Disney Studios Home Entertainment gave the family film a rollout similar to the studio’s more successful animation of the year, Gnomeo & Juliet, which also came out in three disc sets. Directed by The Prince of Egypt‘s Simon Wells, Mars Needs Mom tells the story of Milo (voiced by Seth Green of TV’s Robot Chicken), a boy who gains a deeper appreciation for his mother (Joan Cusack, TV’s Shameless) after she’s taken away by Martians. I have to admit, I was one of those people who stayed away when this sci-fi movie hit theaters — and I like alien films, especially the cartoon kind. But the film’s Polar Express animation style, which looks even more creepy in Mars, was one of the reasons. Produced by Robert Zemeckis’ company, Mars‘ downfall helped Disney to quickly cancel production of its remake of the Beatles Yellow Submarine, which was being done by the same company. All we can say about that is, Phew! The studio set these prices for the Mars Needs Moms discs: DVD $29.99, Blu-ray/DVD combo $39.99 and Four-Disc Blu-ray 3D/Blu-ray/DVD combo with a downloadable digital copy $49.99. And the Blu-ray 3D includes everything on the DVD and Blu-ray, plus the exclusive 3D alternate scene “Mom Napping,” about the Martian abduction. The film also was released the same day for movie download, including the two featurettes on the DVD as well as three of the deleted scenes. What do you think? Will you take a chance on this on disc? Maybe a rental if you have kids? Here’s the trailer. Don’t you think those people look creepy?